TThe Hotel Hostalillo in Tamariu is set within one of the most beautiful and exclusive areas on the Costa Brava: La Petita Costa Brava is located in the Lower Empordà region, a short 110 km from Barcelona and just 45 km from Girona. It offers the Cami Ronda walkway, hiking and Nordic walking, scuba diving, kayaking and golf courses, among other activities. Once you’re here you can easily visit a great variety offascinating places of interest in the Empordà, including scenery, beach coves, music festivals, gastronomy, museums and culture… A huge range of activities that you can enjoy both individually and as a family or group. The Costa Brava has eight golf courses, the nearest to Tamariu being the Platja de Pals Golf Course. There are also various pitch and putt courses, such as the par 3 course in Gualta. Golf tourism generates an economy of 340 million euros per year in Spain, according to a study presented at the International Golf Travel Market (IGTM). Indeed, the study shows that Spain is the preferred travel destination for golf among fans of the sport from the United Kingdom, France, Germany and Scandinavia. The specific factors that make Spain a leading golf destination among European travellers, according to the market research company that conducted the study, are the level of excellence and number of its golf courses, the high quality of its hotels and the mild year-round climate. Did you know about the ‎Gala a Dalí Castle in Púbol, just 30 minutes from Tamariu‬. If you’re interested in art and culture, a perfect plan could be to visit with the family one weekend and get out there and enjoy the works of one of the most significant Catalan artists of all time. In fact, the Dali Triangle is a route that links the three crucial Empordà centres that allow you to get to know more about Salvador Dalí, both in the biographical and artistic sense. The route starts at the birthplace of the genius artist, Figueres, where you’ll find the the Dali Theatre-Museum; it continues in Cadaqués, and more specifically in the small fishing centre of Portlligat, where the Salvador Dali House-Museum is located, and then finishes in the area of Pera, where Castle stands in Púbol. In August 2014 the stretch of the Cami de Ronda pathway between Tamariu andAigua Xelida was opened. Josep Plawa’s one of the most significant and prolific writers in Catalan literature, indeed, he gave his name to one of the most important literary prizes in the language. Born in Palafrugell, near Calella, Begur, el Far de Sant Sebastià, Llafranc… the surrounding landscapes are repeated in many of his works, as he loved them as much as life itself. Pla travelled a lot throughout Europe during his youth as a journalist working in different media. Berlin, Paris, London, Rome, Geneva, Majorca and Madrid are just a few of the cities that he came to know. After 1939, Pla was mainly based in Llofriu, at Pla Farm, where he continued his literary activity, describing in various works (the Costa Brava Guide, for example) the Empordà landscapes that surrounded him. 1- Birthplace, Palafrugell (Calle Nou, 49). Josep Pla was born here in1897;currently it is the headquarters of the Josep Pla Foundation. A must-see for those who wish to have a complete vision of his work, thanks to the exhibitions that are on show. 2- Pla family home, Palafrugell (Calle Torres Jonama, 56). They moved from his birthplace to this house years later. It now belongs to the writer’s niece and is not open to the public. 3- Plaça Nova, Palafrugell. This is the most central square in Palafrugell and where we find the Centro Fraternal, a centre where Josep Pla typically took part in social gatherings. 4- Tamariu, Palafrugell. The small fishing village on the Palafrugell coast, near Begur, which can be accessed by an ancient pathway described by Pla. 5- AiguaXelida cove, Begur. In this cove there is a hut that belonged to the fisherman Hermós, one of Josep Pla’s best friends and a unique character featured in his works. Pla spent many afternoons with him, sailing boats around the area or preparing sardine barbeques on the beach.During your journey along the Pla Route the beautiful AiguaXelida cove in Begur is not to be missed! 6- Sant Sebastià lighthouse. A scenic viewing point repeatedly visited by Josep Pla anda source of great inspiration in his works. 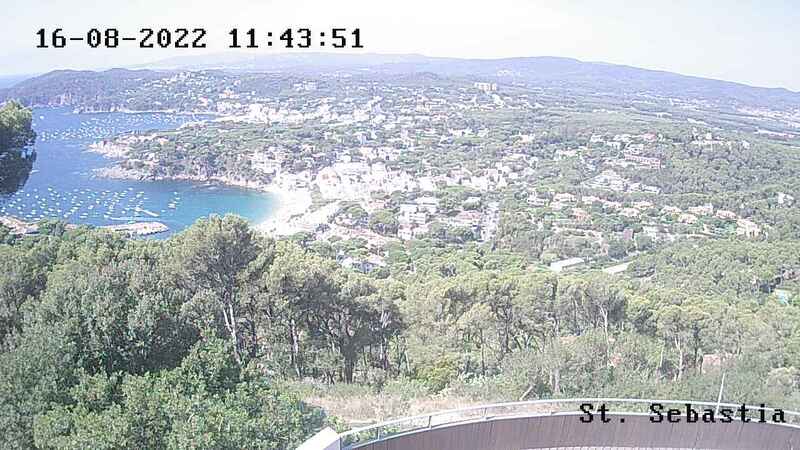 The views from this site over Llafranc and the northern coast are just incredible, and there is a defense tower, an Iberian archeological site and a hermitage. 7- Llafranc. Another of the beautiful Palafrugell beaches, also used by fishermen, and to the north is the impressive mountain on which the Sant Sebastià lighthouse stands. 8- El Canadell, Calella de Palafrugell. A lovely beach with a beautiful rock configuration where the Pla family summerhouse is located. Pla spent many summers here, including throughout his adult life, since it was the Pla family summer residence. 9- Port-bo, Calella de Palafrugell. Nestled beside Canadell, and connected to it by a lovely promenade, this beach has the attraction of some beautiful and famous arcades providingshade for those who wish to pause and admire the view, opposite the intriguing rock formations that enter the sea at this point. 10- Pla Farm, Llofriu (on the outskirts of Palafrugell). The Pla family had a traditional Catalan farmhouse where they spent the winters. At this house, which belongs to Pla’s descendant sand is not open to the public, Josep Pla died on 23 April 1981, and this was where he spent the majority of his life, especially after 1939. 11- Llofriu cemetery. Here we find the writer’s tomb in a niche in this cemetery. His wish was to be buried within his own parish and this wish was honoured. We cannot conclude our Pla route without mentioning another of the impressive scenic viewing points that the man found highly inspirational, the Torre de les Hores in Pals, with some marvelous views of inland Empordà. Top Tip! Mainly due to the distances you may find it more comfortable to travel this route by bicycle or cover some sections in a vehicle rather than walking the whole way. We hope you enjoy your Pla Route!